Just like any download from the Internet, picture download can take time. 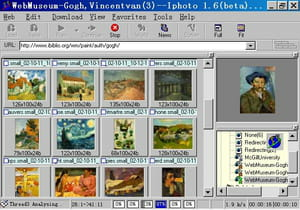 Web Pictures Downloader is a program for downloading and presenting images from the web galleries. Analysis: before all download processes to start, Web Pictures Downloader begins an analysis of the website the user wants the pictures. It analyzes the structure of the website as well as finding the pictures and photos contained there. Download: after the analysis, Web Pictures Downloader lets users select the images they want to download. The process just takes a few seconds and you can have your favourite picture on your hard disk drive after specifying the target folder they will be stored. The interface of this application is quite intuitive and graphical. Pictures are displayed as thumbnail for a better handling. The date, size and name of each file are also available for users just with same interface. Extras: apart from the features mentioned above, Web Pictures Downloader also offers some basic editing tools and enables to create favourites. Download speed and remaining times can also be viewed thanks to the interface. Latest update on November 20, 2016 at 05:00 PM.